Miss Mouse's House - David Fleming - Miss Mouse's House is a wonderfully illustrated journey through a child's dream of what was, what is, what ifs, and maybes that reinforces the notion that although we can never know exactly what the future will hold, it's rarely as scary as it may seem. Book Series Review:"The Adventures of Andi O'Malley" series of five books by Celeste M. Messer incorporates the idea of making ripples in the water of life - that by doing a good deed for one person, that person will do a good deed for another, and so on. Andi O'Malley, her family and friends, the eccentric Miss Bluebonnet, Andi's guardian angel Jelly Roll, and an assortment of other angels and villains will keep young readers interested and anxious to read the next book. These books handle sensitive issues that all children will eventually face in real life, and provide parents and teachers with a wonderful starting point for conversations with young ones. Larry's Review: Finally a book series that is a positive influence that teaches values and character to your children. AND. . . they are fun and exciting to read. "The Adventures of Andi O'Malley" series presents a tidal wave of wisdom that is lightyears beyond, "See spot run!" An intelligent choice. The Circle of Light - The Adventures of Andi O'Malley - Celeste M. Messer - The world is about to be taken over by Zykien, the most evil of all angels of darkness. With the help of Miss Bluebonnet, andi and her friends discover the incredible power of goodness that can result when people work together. The Gift - The Adventures of Andi O'Malley - Celeste M. Messer - Andi receives an assignment from her gardian angel. At first, she's excited, but she becomes furious when she realizes what the job involves. Although andi tries desperately to get out of completing her assignment, she learns there is not turning back. What happens in the end could only happen to andi O'Malley. Three Miracles - The Adventures of Andi O'Malley - Celeste M. Messer - Three young people are in a terrible accident caused by a drunk driver. Their voices are heard, but only by Andi's friend Troy. When he proves to Andi and her sister and brother that he's not making it up, the voices give them three tasks that will change their lives and the lives of several others forever. The Broken Wing - The Adventures of Andi O'Malley - Celeste M. Messer - Andi is visited by a little angel with a broken wing who needs Andi to hide her while she heals. Rather than hide her, however, Andi brings the little angel to school where no one could have expected the lessons everyone would learn! 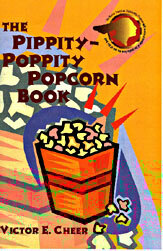 The Pippity-Poppity Popcorn Book - Victor E. Cheer - This book is a wonderful collection of 65 favorite old fashioned popcorn recipes. By combining different flavors the author has created a new popcorn treat for every week of the year. It's popular with children and teachers as it holds lots of opportunities for science, math, and language arts projects. Larry's Review: Fun and entertaining for the whole family. Victor Cheer takes "plain" popcorn to a new an exciting level. A terrific gift for the kids!